Citation: C N Trueman "Russia and War"
There was no united front in Russia when war was declared on Germany and Austria. 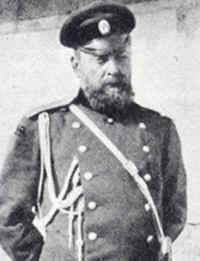 The Prime Minister, Goremykin, followed the patriotic line and had greater access to Nicholas than most other ministers. However, ministers such as Sazinov, the Foreign Minister, were far more cautious. Even the War Minister, Sukhomlinov, was unsure of whether Russia was capable of fighting a war against Germany. The memory of the disastrous Russo-Japanese War was still strong and it is possible that psychologically Russia had not got over the defeat. Goremykin managed to persuade Nicholas to address a crowd in front of the Winter’s Palace. The tsar received a very warm reception as did his announcement that St Petersburg’s, named after Peter the Great, would be re-named Petrograd as St Petersburg was considered to be too German sounding. Goremykin had correctly sensed that the people of the city would rally to the tsar in his nation’s hour of need. Therefore, the actual announcement of war did not speed up the revolutionary process. The war did a great deal to cement the relations between Britain, Russia and France. French investment in Russia’s industry was effectively financing its development. It was believed that Britain’s naval might and the armies of Russia and France would be more than a match for Germany. Almost overnight, strikes stopped in Russia as the people rallied to the tsar. The declaration of war had also divided the revolutionaries. Many also rallied to the patriotic call, the most prominent being Plekhanov. For the time being, those calling for peace were sidelined. However, the fears of Sukhomlinov soon manifested themselves. Russia simply was not ready for war against a nation as powerful as Germany. No plans had been drawn up to put Russia’s economy on a war footing. Her industrial growth had been in heavy industries but not in producing modern weapons. When Russia entered the war, her army stood at 1.5 million men – far larger than the British Army and numerically a match for the German Army. With 3 million reservists, on paper Russia was an awesome military force. However, figures can be misleading. Many were simply no more than cannon fodder. The Russian Army had 60 heavy artillery batteries. The German Army had 381. Russia had 2 machine guns per battalion. Germany had 36. Russia also ran out of ammunition for its infantrymen in December 1914. The Russian Army averaged one surgeon for every 10,000 men. Many wounded men died from wounds that would have been treated on the Western Front. With medical staff spread out across a 500 mile front, the likelihood of any Russian soldier receiving any form of medical treatment bordered on zero. To start with, the Russian Army was successful against both the Germans and Austrians. Germany was attacked via East Prussia and Austria via the Carpathians. When soldiers ran out of ammunition, they fought with their bayonets. No one doubted the courage of the Russian soldier. The initial successes also managed to mask the chronic problems in the Russian Army. The Russians lost 100,000 men in one day of the Battle of Tannenburg. Ironically, the greatest impact the Russians had was on the Western Front. The Germans was so concerned at the unexpected advances into Prussia that the Russians had made, they moved two divisions from the Western Front to the Eastern Front. This was not part of the Schlieffen Plan and it gave the French the breathing space they needed at the Marne to stop the Germans advance on Paris. The Brusilov Offensive was very successful but only in the short term. It was also against the Austrian Army – not the German Army. Conditions in the Russian Army were poor. Combined with the appalling death rate, there were food shortages and shelter depended on where you were at any particular moment in time. As the war progressed, desertion became more common – as did the killing of officers by their own men. Agents from the soviets brought propaganda to the war front to encourage mutiny and to spread revolutionary ideas. They found that many were willing to listen. When the tsar called for loyal troops to put down the March 1917 Revolution, he found few that were prepared to obey. The calamitous campaign could easily have been pinned on the generals in the Russian Army. Nicholas need not have been linked to their failings. However, when he decided to go to the war front to take personal command of the Russian Army himself as commander-in-chief, he shouldered all the blame for the defeats on himself. To some it was a heroic action – to others it was a very foolish one.